I'm not sure why, but Thailand has been on my mind a lot lately. I thought posting the Sweet & Spicy Thai Pineapple Cocktail would be enough to get it out of my system but I was wrong. Some places just stick with you I guess. Like sweetened condensed milk to a spoon. Get it? When we arrived in Bangkok, I remember being totally shocked at the overwhelming heat and humidity. This combined with a little dose of jet lag made me ache for coffee. Of course, I couldn't stand the thought of hot coffee since I felt like I was melting right there on the pavement in the middle of Bangkok. It wasn't until the morning after we arrived that I was finally able to indulge in a big, cold glass of iced coffee. At the time, I knew nothing about Thai or Vietnamese-style iced coffee so I was surprised when I saw sweetened condensed milk going into my glass. Honestly, I was pretty disappointed and sure that I would hate it. I'm usually a straight up coffee with milk kind of gal. No sugar in my coffee thankyouverymuch. I was pleasantly surprised when I took the first sip. The sweetened condensed milk actually had a nice, gentle sweetness that tasted different than adding regular sugar. I'm not sure exactly what it is, but the flavor of strong coffee at that moment was the most perfect combination. The only other time I remember being so happy to have a cup of coffee in my hands was in Argentina when I first tried café con crema. It was dreamy. But I'll save that story for another day. Sweetened condensed milk always makes me think of Thailand because there were cans stacked at many of the food carts. My guess is because it comes in a can, giving it the ability to withstand the heat without spoiling, it just makes more sense than regular milk. Whatever the reason, I'm glad they made the connection. 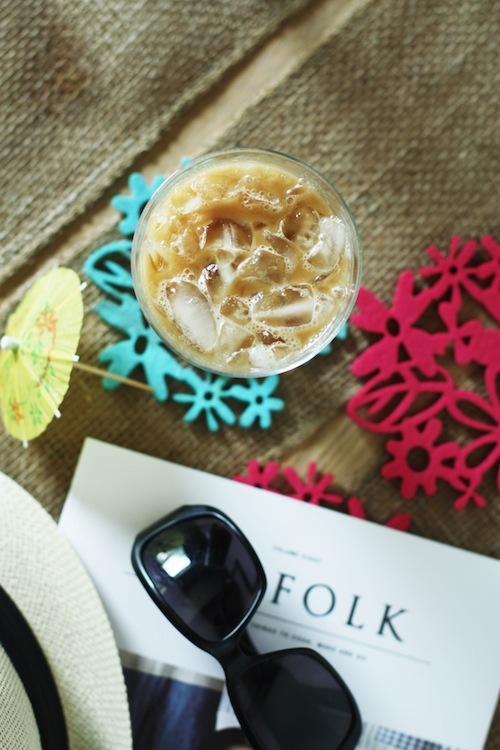 This drink is the perfect way to welcome the first official day of summer (TODAY!) while reading a good book in the shade. As you can tell by my photos, it's already hot here in Denver. Hello, condensation! You can make this a cocktail by adding a shot of vodka. Vanilla vodka would also be tasty if you have more of a sweet tooth, but I like to keep it simple with straight up vodka. And you can of course keep this virgin by not adding any alcohol. Versatile and delicious! In a glass (not the one you will be drinking out of) combine the sweetened condensed milk with the coffee and vodka (if using). Stir until the milk is completely incorporated into the coffee. Fill your serving glass with crushed ice and add your coffee. Garnish with a cocktail umbrella (you'll be happy you did- they are just so fun, especially on Fridays) and enjoy!